DIE Martis, 22 die Januarii. Message to H. C. about some Members of their House, whom L. Mordant will want to summon as Witnesses. Sir Rich. Fanshaw, born in Spain, Report concerning his Nat. Judges to give their Opinion about the Necessity of naturalizing Ambassadors Children born Abroad. Message from thence, about some of their Members being Witnesses for Ld. Mordant;- and for Witnesses on their Behalf to attend. Witnesses to attend, in Behalf of H. C. against Ld. Mordant. Wetton, E. of St. Albans' Servant, arrested. Ride and Simes to be attached. Message from H. C. with Votes concerning Goods belonging to French Merchants, seized as being imported contrary to the King's Proclamation. D. of Bucks' Claim to the Title of Ld. Roos. Hodie 2a vice lecta est Billa, "An Act for Confirmation of a Settlement of the Estate of Sir Seymour Shirley Baronet." Hodie 2a vice lecta est Billa, "An Act for settling the Moiety of the Manor of Iron Acton on Sir John Poyntz." The Question being put, "Whether this Bill shall be committed to the same Committee as Sir Seymour Shirley's Bill is?" It is recommended to this Committee, to hear all Parties concerned, and to receive their Consents to the passing of this Bill. To let them know, that the House of Peers being acquainted, on the Behalf of the Lord Viscount Mordant, "That some material Witnesses his Lordship hath Occasion to make Use of, in his Defence to the Impeachment brought up by the House of Commons, are Members of that House, videlicet, Sir George Carteret Vice-Chamberlain of His Majesty's Household, Sir John Denham Knight of the Bath, Sir Richard Braham, and Sir Thomas Woodcock, Knights;" the Lords have thought fit to give Notice thereof to the House of Commons, that they may give Directions for their Attendance at the Hearing. The Lord Viscount Say & Seale reported, "That the Committee have considered of the Bill for naturalizing Dame Mary Frazer and others; and, according to the Direction of this House, have added Four Persons Names to be naturalized; which Persons the Lords are satisfied that they have taken the Oaths and received the Communion, according to the Statute." His Lordship further reported, "That the Committee have considered of the Case of Sir Richard Fanshawe, in the Bill mentioned, among the Persons to be naturalized; and finding that it was the Desire and Directions of his Father Sir Richard Fanshawe, upon his Death-bed, that his Son should be naturalized, their Lordships thought fit to continue his Name in the said Bill, though they were not fully satisfied whether this may not in future be urged to the Prejudice of Children of Ambassadors born in Foreign Countries; and therefore are of Opinion, That either the Judges Opinions might be had in the Case, or else, that the particular Cause of his being naturalized might be entered into the Journal of this House, to the End it may not be brought in Precedent to the Prejudice of others." Upon this, the House ORDERED, That such Judges as are in Town shall meet this Afternoon, to consider, in the Case of Sir Richard Fanshaw Baronet, an Infant, Son of Sir Richard Fanshawe Baronet, deceased, late Ambassador in Spaine (where the said Sir Richard the Infant was born, who is now named in a Bill before this House to be naturalized), and to report their Opinion to this House, whether the Son of an Ambassador employed by the King in Foreign Parts be an Alien or no. To acquaint this House, that the Commons have permitted those Persons, mentioned by their Lordships Message, to be ready as Witnesses for the Lord Viscount Mordant. Also to signify the Desire of the House of Commons, That this House would please to issue out a Warrant for summoning several Persons (whose Names are contained in a Paper now brought up) to appear at the Time appointed for hearing the Lord Viscount Mordant's Cause, upon the Impeachment brought up by the House of Commons against him; the Testimony of which Persons the Commons shall have Occasion of at the Hearing of the said Cause." 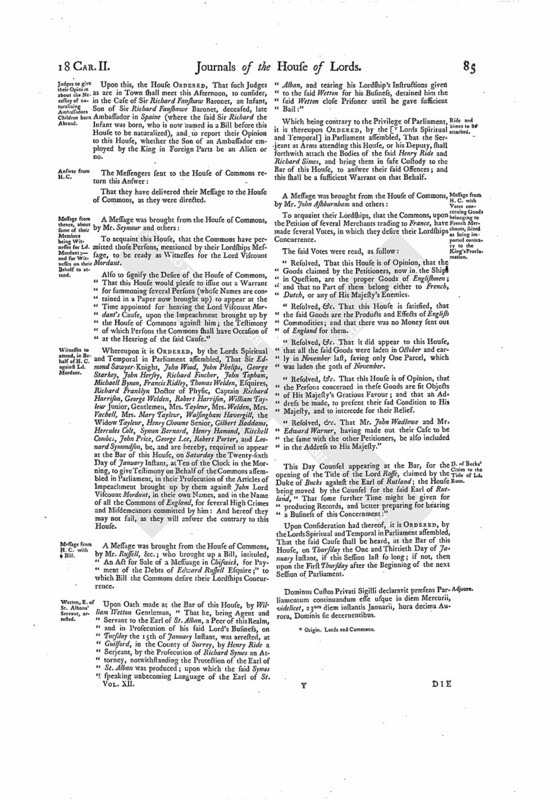 Whereupon it is ORDERED, by the Lords Spiritual and Temporal in Parliament assembled, That Sir Edmond Sawyer Knight, John Wood, John Phelips, George Starkey, John Hersey, Richard Fincher, John Topham, Michaell Bynon, Francis Ridley, Thomas Welden, Esquires, Richard Franklyn Doctor of Physic, Captain Richard Harrison, George Welden, Robert Harrison, William Tayleur Junior, Gentlemen, Mrs. Tayleur, Mrs. Welden, Mrs. Vachell, Mrs. Mary Tayleur, Walsingham Havergill, the Widow Tayleur, Henry Chowne Senior, Gilbert Baddams, Hercules Colt, Symon Bernard, Henry Hamond, Kitchell Combes, John Price, George Lee, Robert Porter, and Leonard Symondson, be, and are hereby, required to appear at the Bar of this House, on Saturday the Twenty-sixth Day of January Instant, at Ten of the Clock in the Morning, to give Testimony on Behalf of the Commons assembled in Parliament, in their Prosecution of the Articles of Impeachment brought up by them against John Lord Viscount Mordant, in their own Names, and in the Name of all the Commons of England, for several High Crimes and Misdemeanors committed by him: And hereof they may not fail, as they will answer the contrary to this House. A Message was brought from the House of Commons, by Mr. Russell, &c.; who brought up a Bill, intituled, "An Act for Sale of a Messuage in Chiswick, for Payment of the Debts of Edward Russell Esquire;" to which Bill the Commons desire their Lordships Concurrence. Upon Oath made at the Bar of this House, by William Wetton Gentleman, "That he, being Agent and Servant to the Earl of St. Alban, a Peer of this Realm, and in Prosecution of his said Lord's Business, on Tuesday the 15th of January Instant, was arrested, at Guilford, in the County of Surrey, by Henry Ride a Serjeant, by the Prosecution of Richard Symes an Attorney, notwithstanding the Protection of the Earl of St. Alban was produced; upon which the said Symos speaking unbecoming Language of the Earl of St. Alban, and tearing his Lordship's Instructions given to the said Wetton for his Business, detained him the said Wetton close Prisoner until he gave sufficient Bail:"
Which being contrary to the Privilege of Parliament, it is thereupon ORDERED, by the [ (fn. 1) Lords Spiritual and Temporal] in Parliament assembled, That the Serjeant at Arms attending this House, or his Deputy, shall forthwith attach the Bodies of the said Henry Ride and Richard Simes, and bring them in safe Custody to the Bar of this House, to answer their said Offences; and this shall be a sufficient Warrant on that Behalf. 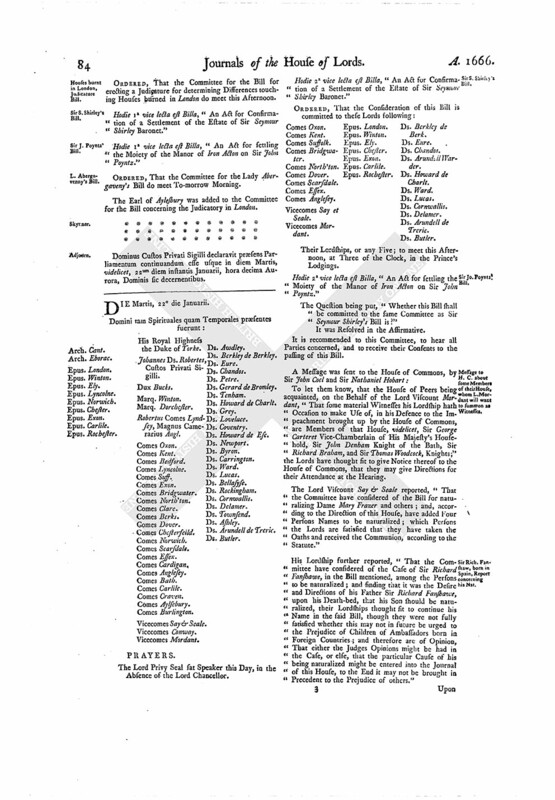 To acquaint their Lordships, that the Commons, upon the Petition of several Merchants trading to France, have made several Votes, in which they desire their Lordships Concurrence. "Resolved, That this House is of Opinion, that the Goods claimed by the Petitioners, now in the Ships in Question, are the proper Goods of Englishmen; and that no Part of them belong either to French, Dutch, or any of His Majesty's Enemies. "Resolved, &c. That this House is satisfied, that the said Goods are the Products and Effects of English Commodities; and that there was no Money sent out of England for them. "Resolved, &c. That it did appear to this House, that all the said Goods were laden in October and early in November last, saving only One Parcel, which was laden the 30th of November. "Resolved, &c. That this House is of Opinion, that the Persons concerned in these Goods are fit Objects of His Majesty's Gracious Favour; and that an Address be made, to present their sad Condition to His Majesty, and to intercede for their Relief. "Resolved, &c. That Mr. John Wadlowe and Mr. Edward Warner, having made out their Case to be the same with the other Petitioners, be also included in the Address to His Majesty." This Day Counsel appearing at the Bar, for the opening of the Title of the Lord Rosse, claimed by the Duke of Bucks against the Earl of Rutland; the House being moved by the Counsel for the said Earl of Rutland, "That some further Time might be given for producing Records, and better preparing for hearing a Business of this Concernment:"
Upon Consideration had thereof, it is ORDERED, by the Lords Spiritual and Temporal in Parliament assembled, That the said Cause shall be heard, at the Bar of this House, on Thursday the One and Thirtieth Day of January Instant, if this Session last so long; if not, then upon the First Thursday after the Beginning of the next Session of Parliament. Dominus Custos Privati Sigilli declaravit præsens Parliamentum continuandum esse usque in diem Mercurii, videlicet, 23um diem instantis Januarii, hora decima Aurora, Dominis sic decernentibus. 1. Origin. Lords and Commons.